Facebook’s IPO was obviously the single most discussed topic on Twitter today. The good folks over at social media data platform DataSift monitored what Twitter users were saying about the IPO throughout the day and came up with some interesting conclusions. Turns out, the ups and downs of how Twitter’s users felt about the stock pretty much mirrored the price of Facebook’s stock as the day progressed. To create this graph, DataSift recorded 95,019 interactions from 58,665 authors over a period of 6 hours. Most interactions, of course, took place right during the early hours after Facebook’s stock started trading (and took an immediate dive from $42 closer to $38). The company also saw a second and much smaller uptick in interactions toward the end of the day as well. For the most part, of course, this is just a fun exercise in tracking Twitter data. 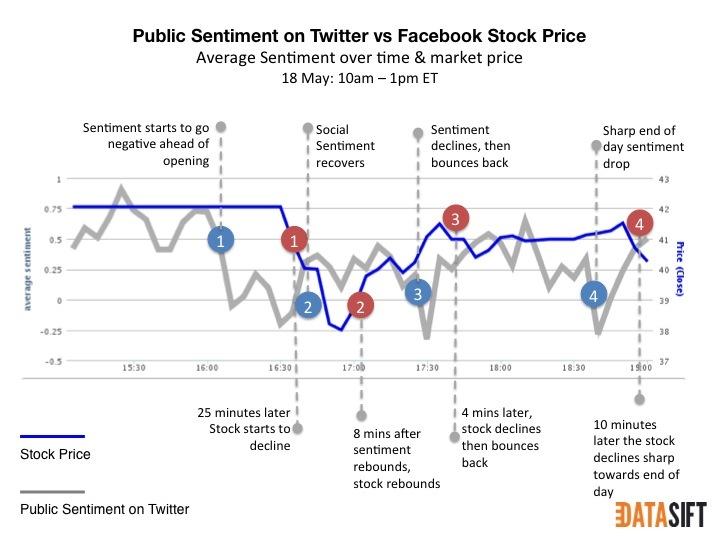 It’s worth noting, though, that quite a few recent studies that looked into the connection between Twitter posts and stock prices found that there is at least a slight correlation between Twitter sentiment and volume and stock prices. You can find a bit more of DataSift’s data, which also takes a closer look at the total volume of posts about the Facebook IPO, here.